Vitamin B12 deficiency anemia, of which pernicious anemia is a type, is a disease in which not enough red blood cells are produced due to a deficiency of vitamin B12. The most common initial symptom is feeling tired. Other symptoms may include shortness of breath, pale skin, chest pain, numbness in the hands and feet, poor balance, a smooth red tongue, poor reflexes, depression and confusion. Without treatment some of these problems may become permanent. Pernicious anemia refers to anemia that results from lack of intrinsic factor. Lack of intrinsic factor is most commonly due to an autoimmune attack on the cells that create it in the stomach. It can also occur following the surgical removal of part of the stomach or from an inherited disorder. Other causes of low vitamin B12 include not enough dietary intake (such as in a vegan diet), celiac disease, or tapeworm infection. When suspected, diagnosis is made by blood and, occasionally, bone marrow tests. Blood tests may show fewer but larger red blood cells, low numbers of young red blood cells, low levels of vitamin B12, and antibodies to intrinsic factor. Because pernicious anemia is due to a lack of intrinsic factor, it is not preventable. Vitamin B12 deficiency due to other causes may be prevented with a balanced diet or with supplements. Pernicious anemia can be easily treated with either injections or pills of vitamin B12. If the symptoms are severe, injections are typically recommended initially. For those who have trouble swallowing pills, a nasal spray is available. Often, treatment is lifelong. The symptoms of pernicious anemia come on slowly. Untreated, it can lead to neurological complications, and in serious cases, death. Many of the signs and symptoms are due to anemia itself, when anemia is present. Symptoms may consist of the triad of tingling or other skin sensations (paresthesia), tongue soreness (glossitis), and fatigue and general weakness. [page needed] It presents with a number of further common symptoms,[page needed][page needed] including depressive mood, low-grade fevers, diarrhea, dyspepsia, weight loss, neuropathic pain, jaundice, sores at the corner of the mouth (angular cheilitis), a look of exhaustion with pale and dehydrated or cracked lips and dark circles around the eyes, as well as brittle nails, and thinning and early greying of the hair. Because PA may affect the nervous system, symptoms may also include difficulty in proprioception, memory changes,[page needed] mild cognitive impairment (including difficulty concentrating and sluggish responses, colloquially referred to as brain fog), and even psychoses, impaired urination, loss of sensation in the feet, unsteady gait, difficulty in walking, muscle weakness[page needed] and clumsiness. Anemia may also lead to tachycardia (rapid heartbeat), cardiac murmurs, a yellow waxy pallor, altered blood pressure (low or high), and a shortness of breath (known as "the sighs"). [page needed] The deficiency also may present with thyroid disorders. [page needed] In severe cases, the anemia may cause evidence of congestive heart failure. [page needed] A complication of severe chronic PA is subacute combined degeneration of spinal cord, which leads to distal sensory loss (posterior column), absent ankle reflex, increased knee reflex response, and extensor plantar response. Other than anemia, hematological symptoms may include cytopenias, intramedullary hemolysis, and pseudothrombotic microangiopathy. Pernicious anemia can contribute to a delay in physical growth in children, and may also be a cause for delay in puberty for adolescents. Vitamin B12 cannot be produced by the human body, and must be obtained from the diet. When foods containing B12 are eaten, the vitamin is usually bound to protein and is released by proteases released by the pancreas in the small bowel. Following its release, most B12 is absorbed by the body in the small bowel (ileum) after binding to a protein known as intrinsic factor. Intrinsic factor is produced by parietal cells of the gastric mucosa (stomach lining) and the intrinsic factor-B12 complex is absorbed by cubilin receptors on the ileum epithelial cells. PA is characterised by B12 deficiency caused by the absence of intrinsic factor. The classic test for PA, the Schilling test, is no longer widely used, as more efficient methods are available. This historic test consisted, in its first step, of taking an oral dose of radiolabelled vitamin B12, followed by quantitation of the vitamin in the patient's urine over a 24-hour period via measurement of the radioactivity. 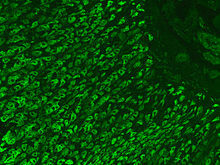 A second step of the test repeats the regimen and procedure of the first step, with the addition of oral intrinsic factor. A patient with PA presents lower than normal amounts of intrinsic factor; hence, addition of intrinsic factor in the second step results in an increase in vitamin B12 absorption (over the baseline established in the first). The Schilling test distinguished PA from other forms of B12 deficiency, specifically, from Imerslund-Grasbeck Syndrome (IGS), a vitamin B12-deficiency caused by mutations in cubilin the cobalamin receptor. 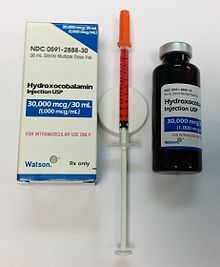 Hydroxocobalamin injection usp(1000 mcg/ml) is a clear red liquid solution of hydroxocobalamin which is available in a 30-ml brown glass multidose vial packaged in a paper box. Shown is 500 mcg B-12 (as 1/2 cc) drawn up in a 0.5-cc U-100 27 gauge x 1/2" insulin syringe, as prepared for subcutaneous injection. The standard treatment for PA has been intramuscular injections of cobalamin in the form of cyanocobalamin (CN-Cbl), hydroxocobalamin (OH-Cbl) or methylcobalamin. Treatment with high-dose vitamin B12 orally also appears effective. However, this was not investigated in more depth until 1849, by British physician Thomas Addison, from which it acquired the common name of Addison's anemia. In 1871, German physician Michael Anton Biermer (1827–1892) noticed the particular characteristic of the anemia in one of his patients; he later coined the term "progressive pernicious anemia". [better source needed] In 1907, Richard Clarke Cabot reported on a series of 1200 patients with PA; their average survival was between one and three years. William Bosworth Castle performed an experiment whereby he ingested raw hamburger meat and regurgitated it after an hour, and subsequently fed it to a group of 10 patients. [full citation needed] Untreated raw hamburger meat was fed to the control group. The former group showed a disease response, whereas the latter group did not. This was not a sustainable practice, but it demonstrated the existence of an 'intrinsic factor' from gastric juice. ^ a b c d e f g Andres E, Serraj K (2012). "Optimal management of pernicious anemia". Journal of Blood Medicine. 3: 97–103. doi:10.2147/JBM.S25620. PMC 3441227. PMID 23028239. ^ a b Professional guide to diseases (9 ed.). Philadelphia: Wolters Kluwer Health/Lippincott Williams & Wilkins. 2009. p. 502. ISBN 9780781778992. Archived from the original on 2016-03-14. ^ Forbis, Pat (2005). Stedman's medical eponyms (2nd ed.). Baltimore, Md. : Lippincott Williams & Wilkins. p. 6. ISBN 9780781754439. ^ a b c "What Are the Signs and Symptoms of Pernicious Anemia?". NHLBI. April 1, 2011. Archived from the original on 14 March 2016. Retrieved 14 March 2016. ^ a b c d e f g "What Is Pernicious Anemia?". NHLBI. April 1, 2011. Archived from the original on 14 March 2016. Retrieved 14 March 2016. ^ a b c "How Is Pernicious Anemia Diagnosed?". NHLBI. April 1, 2011. Archived from the original on 14 March 2016. Retrieved 14 March 2016. ^ a b c d "How Is Pernicious Anemia Treated?". NHLBI. April 1, 2011. Archived from the original on 14 March 2016. Retrieved 14 March 2016. ^ "ICD-10 Version:2015". apps.who.int. Archived from the original on 2015-11-02. Retrieved 2015-11-13. ^ a b c "What Causes Pernicious Anemia?". NHLBI. April 1, 2011. Archived from the original on 14 March 2016. Retrieved 14 March 2016. ^ a b "How Can Pernicious Anemia Be Prevented?". NHLBI. April 1, 2011. Archived from the original on 14 March 2016. Retrieved 14 March 2016. ^ a b "Living With Pernicious Anemia". NHLBI. April 1, 2011. Archived from the original on 14 March 2016. Retrieved 14 March 2016. ^ Greer, John P. (2009). Wintrobe's clinical hematology (12th ed.). Philadelphia: Wolters Kluwer Health/Lippincott Williams & Wilkins. p. 1157. ISBN 9780781765077. Archived from the original on 2016-03-14. ^ Dictionary of Medicine. Routledge. 2014. p. 404. ISBN 9781135928414. Archived from the original on 2016-03-14. ^ Tamparo, Carol (2016). Diseases of the Human Body. F.A. Davis. p. 295. ISBN 9780803657915. Archived from the original on 2016-03-17. ^ In 20% of cases of cobalamin deficiency, anemia is not observed. ^ a b Hvas AM, Nexo E (November 2006). "Diagnosis and treatment of vitamin B12 deficiency—an update". Haematologica. 91 (11): 1506–12. PMID 17043022. ^ a b c Wickramasinghe, SN (November 2006). "Diagnosis of megaloblastic anaemias". Blood Reviews. 20 (6): 299–318. doi:10.1016/j.blre.2006.02.002. PMID 16716475. ^ Christensen EI, Birn H (April 2002). "Megalin and cubilin: multifunctional endocytic receptors". Nat. Rev. Mol. Cell Biol. 3 (4): 256–66. doi:10.1038/nrm778. PMID 11994745. ^ a b c Banka S, Ryan K, Thomson W, Newman WG (June 2011). "Pernicious anemia – genetic insights". Autoimmunity Reviews. 10 (8): 455–9. doi:10.1016/j.autrev.2011.01.009. PMID 21296191. ^ De Block CE, De Leeuw IH, Van Gaal LF (February 2008). "Autoimmune gastritis in type 1 diabetes: a clinically oriented review". The Journal of Clinical Endocrinology and Metabolism. 93 (2): 363–71. doi:10.1210/jc.2007-2134. PMID 18029461. ^ a b c Lahner E, Annibale B (November 2009). "Pernicious anemia: New insights from a gastroenterological point of view". World J. Gastroenterol. 15 (41): 5121–8. doi:10.3748/wjg.15.5121. PMC 2773890. PMID 19891010. ^ Desai HG, Gupte PA (December 2007). "Helicobacter pylori link to pernicious anaemia". The Journal of the Association of Physicians of India. 55: 857–9. PMID 18405134. ^ Kaferle J, Strzoda CE (Feb 1, 2009). "Evaluation of macrocytosis". American Family Physician. 79 (3): 203–8. PMID 19202968. ^ von Drygalski A, Andris DA (Apr–May 2009). "Anemia after bariatric surgery: more than just iron deficiency". Nutrition in Clinical Practice : Official Publication of the American Society for Parenteral and Enteral Nutrition. 24 (2): 217–26. doi:10.1177/0884533609332174. PMID 19321896. ^ John S, Hoegerl C (November 2009). "Nutritional deficiencies after gastric bypass surgery". The Journal of the American Osteopathic Association. 109 (11): 601–4. PMID 19948694. ^ Oh R, Brown DL (Mar 1, 2003). "Vitamin B12 deficiency". American Family Physician. 67 (5): 979–86. PMID 12643357. ^ O'Leary F, Samman S (March 2010). "Vitamin B12 in health and disease". Nutrients. 2 (3): 299–316. doi:10.3390/nu2030299. PMC 3257642. PMID 22254022. ^ Stover, PJ (June 2004). "Physiology of folate and vitamin B12 in health and disease". Nutrition Reviews. 62 (6 Pt 2): S3–12, discussion S13. doi:10.1111/j.1753-4887.2004.tb00070.x. PMID 15298442. ^ Devalia V (August 2006). "Diagnosing vitamin B-12 deficiency on the basis of serum B-12 assay". BMJ. 333 (7564): 385–6. doi:10.1136/bmj.333.7564.385. PMC 1550477. PMID 16916826. ^ a b c Snow, CF (Jun 28, 1999). "Laboratory diagnosis of vitamin B12 and folate deficiency: a guide for the primary care physician". Archives of Internal Medicine. 159 (12): 1289–98. doi:10.1001/archinte.159.12.1289. PMID 10386505. ^ Grasbeck R (2006). "Imerslund-Grasbeck syndrome (selective vitamin B12 malabsorption with proteinuria)". Orphanet Journal of Rare Diseases. 1 (1): 17. doi:10.1186/1750-1172-1-17. PMC 1513194. PMID 16722557. ^ a b Moridani, Majid; Shana Ben-Poorat (March 2006). "Laboratory Investigation of Vitamin B12 Deficiency". LabMedicine. 37 (3): 166–74. doi:10.1309/cvhkle2r4w68k2nq. ^ Butler CC, Vidal-Alaball J, Cannings-John R, et al. (June 2006). "Oral vitamin B12 versus intramuscular vitamin B12 for vitamin B12 deficiency: a systematic review of randomized controlled trials". Family Practice. 23 (3): 279–85. doi:10.1093/fampra/cml008. PMID 16585128. ^ Andres E., Serra K. (2012). "Optimal management of pernicious anemia". Journal of Blood Medicine. 3: 97–103. doi:10.2147/JBM.S25620. PMC 3441227. PMID 23028239. ^ a b Andrès, E.; Fothergill, H.; Mecili, M. (2010). "Efficacy of oral cobalamin (vitamin B12) therapy". Expert Opinion on Pharmacotherapy. 11 (2): 249–256. doi:10.1517/14656560903456053. PMID 20088746. ^ Andrès, E.; Dali-Youcef, N.; Vogel, T.; Serraj, K.; Zimmer, J. (2009). "Oral cobalamin (vitamin B12) treatment. An update". International Journal of Laboratory Hematology. 31 (1): 1–8. doi:10.1111/j.1751-553X.2008.01115.x. PMID 19032377. ^ Carmel, R. (7 July 2008). "How I treat cobalamin (vitamin B12) deficiency". Blood. 112 (6): 2214–2221. doi:10.1182/blood-2008-03-040253. PMC 2532799. PMID 18606874. ^ Stabler S. P., Allen R. H. (2004). "Vitamin B12 deficiency as a worldwide problem". Annual Review of Nutrition. 24 (1): 299–326. doi:10.1146/annurev.nutr.24.012003.132440. PMID 15189123. ^ "History of Leith, Edinburgh". leithhistory.co.uk. Retrieved 11 March 2016. ^ John G. Sotos, What an Afflication -- Mary Todd Lincoln's Fatal Pernicious Anemia. Perspectives in Biology and Medicine. 2015; 58: 419-443. ^ Castelli, M. C.; Wong, D. F.; Friedman, K.; Riley, M. G. I. (2011). "Pharmacokinetics of Oral Cyanocobalamin Formulated with Sodium N-\8-(2-hydroxybenzoyl)amino]caprylate (SNAC): An Open-Label, Randomized, Single-Dose, Parallel-Group Study in Healthy Male Subjects". Clinical Therapeutics. 33 (7): 934–945. doi:10.1016/j.clinthera.2011.05.088. PMID 21722960. ^ Fedosov, S. N.; Laursen, N. B.; Nexo, E.; Moestrup, S. K.; Petersen, T. E.; Jensen, E. O.; Berglund, L. (2003). "Human intrinsic factor expressed in the plant Arabidopsis thaliana". European Journal of Biochemistry. 270 (16): 3362–3367. doi:10.1046/j.1432-1033.2003.03716.x. PMID 12899693. ^ Sharabi, A.; Cohen, E.; Sulkes, J.; Garty, M. (2003). "Replacement therapy for vitamin B12 deficiency: Comparison between the sublingual and oral route". British Journal of Clinical Pharmacology. 56 (6): 635–638. doi:10.1046/j.1365-2125.2003.01907.x. PMC 1884303. PMID 14616423. ^ Slot WB, Merkus FW, Van Deventer SJ, Tytgat GN (August 1997). "Normalization of plasma vitamin B12 concentration by intranasal hydroxocobalamin in vitamin B12-deficient patients". Gastroenterology. 113 (2): 430–3. doi:10.1053/gast.1997.v113.pm9247460. PMID 9247460. ^ Zeltman, Jon D. (2015-01-27). "Patent US20080233180 - Transdermal Patch and Method For Delivery Of Vitamin B12". google.com. Archived from the original on 24 April 2016. Retrieved 11 March 2016. Priority date, 2007-03-19. This page was last edited on 18 February 2019, at 23:03 (UTC).